This article is part of a web dev tech series from Microsoft. Thank you for supporting the partners who make SitePoint possible. Recently at //build/ 2015, Microsoft announced manifoldJS – the simplest way to build hosted apps across platforms. While John Shewchuk, Technical Fellow and the CTO for the Microsoft Developer Platform, did a great job building a hosted web app right on-stage (you can see the recap here), I’d like to go into a bit more detail and explain why you’d want to use Hosted Web Apps and explain how to build one for yourself using manifoldJS. Hosted Web Apps bring the best of the web to store apps with minimal effort. They are a great way to reach more users with the experience you’ve already built. And when you update your web experience, your users get the same update in hosted web apps too! The problem is, until now, the hard thing about hosted apps was how different the process is on every platform. 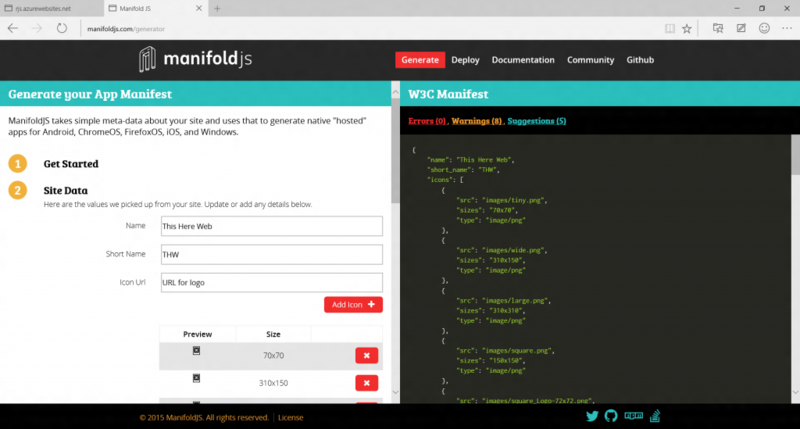 manifoldJS changes that by putting the focus on the W3C Manifest for Web Apps – a standards-driven, open source approach for creating apps – and then uses that metadata to create a hosted native app on Android, iOS, and Windows. When a platform supports hosted apps, we build it natively and then we use Cordova to polyfill the platforms that don’t have native support. There are basically two ways to get going. If you’re a web developer who lives in the command line, start with the CLI interface. For devs who want to run manifoldJS in the cloud, we have the same tools on the website. For more details on building a manifest file, including how to serve it from your web server, check out this post on the manifest. If you want a little help building that manifest, try the code generator on the manifoldjs.com site. We’ll walk you through the values you need with the wizard, and then provide you with a completed manifest for your website at the end. ManifoldJS runs on familiar technologies. The only requirement is that you have Node.js installed. ManifoldJS will run on any system (Mac, Linux, and Windows) but can only build apps for platforms that are supported on that system. If you have a manifest on your site, it will pull it down, along with the corresponding images, and build the apps from it. If you don’t have a manifest on the site, we will simply assume some default data and generate your apps, along with a manifest for you. We’ll also use placeholder images so we can still build the tools. -m|–manifest (optional) Location of the W3C Web App manifest file (URL or local path). If not specified, the tool looks for a manifest in the site URL. Otherwise, a new manifest will be created pointing to the site URL. All this same great functionality is available in our web-based tool as well. Visit the web generator and get started. Once you complete the steps, you’ll just click on the download at the end, and a zip with all your packages will be sent to you. The Manifest for Web Apps allows you to specify the “scope” of your app. 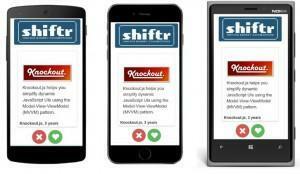 This helps determine where your app stops, and the open web begins. Only URLs within your scope will show up in the app. If you’re using more than one domain, or are calling content from our domains, simply add in URI access values to your manifest. As web developers, we are always asking for APIs that help us blur the lines between the feature set of native apps and that of the web. Hosted Web Apps are a trusted environment on most platforms, where the code is tied directly back to a developer. Because of this, some platforms allow you to have access to native APIs that you can’t reach in the browser. With the access rules in place, we’ll turn on the APIs for you to call directly, or call through the cordova APIs. We’re working to make the process of building hosted web apps even easier, but for now there are still a few final steps that will be in hands of the developers to complete. For every platform, we provide how to deploy to each App Store. Testing is an important part of app development and we also have tips and suggestions for getting the most out of your hosted web app. Also, the apps all have to be submitted to the appropriate app stores, and we will point you in the right direction for that as well. Hosted web apps allow you to develop store apps while maintaining the integrity and uniqueness of the Web. Now, developing those apps just got a little simpler with manifoldJS. You focus on the web standards, we’ll do the rest. And some free tools: Visual Studio Community, Azure Trial, and cross-browser testing tools for Mac, Linux, or Windows. Great stuff, I think ManifoldJS looks promising. One question though: in order to use cordova plugins on your native devices, you need to add them to your website prior to generating the projects with manifoldjs? Or should you add them to your project after generating with manifoldjs?